Virginia Printing Company in Hampton Roads | Harrington Graphics, Inc.
We offer the latest and greatest. Today. And tomorrow. HarringtonGraphics is absolutely committed to offering the latest in sign and imaging technologies. In fact, we use some of the best technology currently available in digital sign making, including three large format printers that will handle the most demanding needs for banners, trade show signage, and vehicle graphics. Add to that our staff's extensive training and years of experience and you can count on the tremendous value Harrington Graphics brings to your project. • If done right, digital reproduction can look crisp for a long time. • It gives us an accurate way to represent data. • Digitized information can often be compressed for easier storage. Mimaki - The JV3 uses a 720 x 720 dpi piezo print head (3 print heads in-line) to print large-scale graphics for indoor and outdoor applications. It can print at speeds up to 422 square feet per hour. 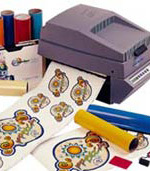 Six colors and a variable dot system produce photo quality output using solvent inks. The advantage to these specialty inks is that they offer a 3 year UV and water resistance with no lamination and 5 years of resistance with lamination. The vast majority of images for outdoor display are printed on nonabsorbent, uncoated materials, such as self-adhesive vinyl and scrim banner. 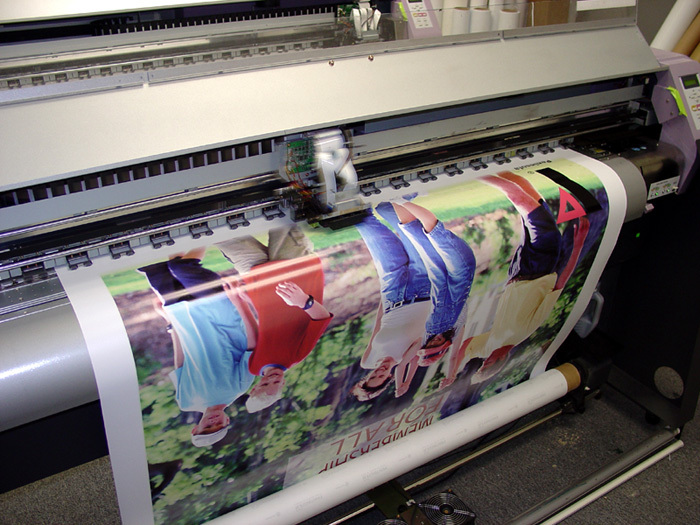 Harrington Graphics uses 3 of these state of the art printers with a print size of 98” x 150 feet without a seam. Gerber Edge2 – Harrington Graphics uses the Edge to create custom color decals, parking stickers, sequential numbered decals and much more in virtually any shape you can imagine. 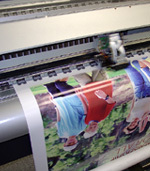 The Edge prints a variety of “spot” colors to standard vinyl, using a high-temperature head to fuse color from a resin ribbon to the vinyl at up to 600 dpi. With the Edge, we can print color fades, graduated blends and other special effects directly onto outdoor vinyl. 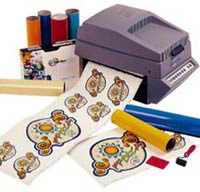 After printing, we can cut decals—sequentially numbered from one to 10,000—to any shape without the cost of die cutting. That can literally save you hundreds of dollars. Epilog / Radius Laser Engraver – This uses the latest technology, providing a powerful tool for engraving. Laser engraving produces a mark that is crisp, clean and permanent. Lasers are also faster than many conventional methods of product imprinting, providing greater versatility in material choices. Also, the same machine can cut through thin materials as well as engrave on them. Our laser engraving machine, combined with the processing power of computers, provides you with low costs and fast turn around times. In fact, we can effectively produce, laser engrave and deliver in days, not weeks.